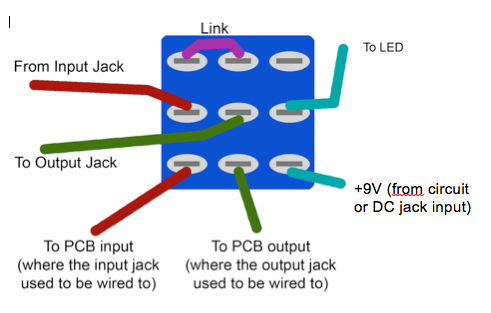 I found out that it was easier for beginners to make a proper true bypass wiring when they fully understand how does it work. Here, we can see that a simple pole, simple throw (SPST) is equivalent to a simple on-off switch; simple pole dual throw (SPDT): equivalent to a toggle switch. So basically, double throw just means that you have two positions for the switch. 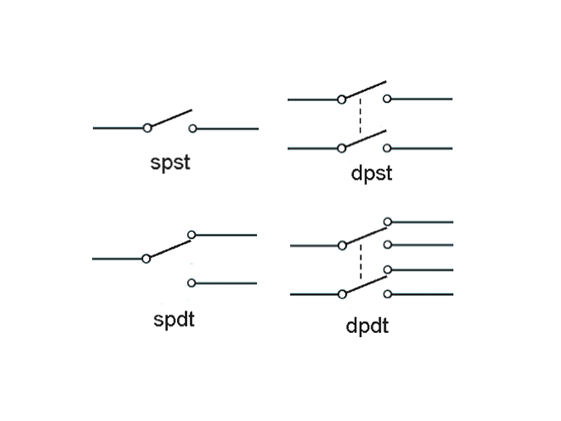 A dual pole, simple throw (DPST) is equivalent to 2 SPST, DPDT: equivalent to 2 SPDT. That means to say that on one position, the middle pins are connected to the ones of the top (2 is connected to 1 for instance), and in another position to the ones on the bottom of the switch. How to use it for true bypass? 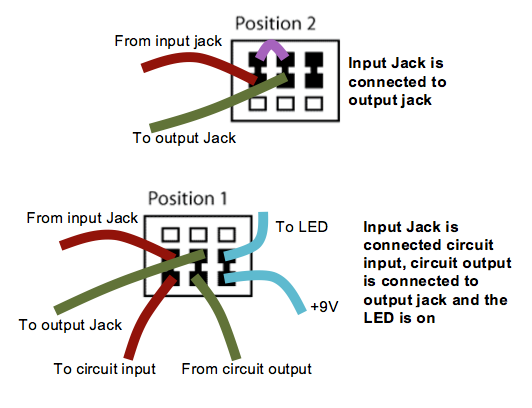 Position 2: input jack goes to the input of the circuit, the output of the circuit is connected to the output jack, and a beautiful shiny LED is on. For position 2, there are 3 conditions to be filled, that is why we need a 3PDT ! That is to say on and off for the guitar pedal! If you do not want to bother to solder directly on the 3PDT (you have to be precise and it is not very practical if you want to modify it afterwards, and most of the times it does not look so good), you can directly use a small PCB to make your true bypass like a boss. You can either make it yourself (model here and here), or buy it (very cheap here). Once again, another helpful guide! Thanks a lot. You have a wonderful way of explaining things.